Eyes need exercise just as much as other muscles do. If you place your arm in a brace for a few weeks it starts to atrophy, or get weaker and smaller; the blood cannot circulate sufficiently to impart strength and growth to the arm muscles. The eyes also have tiny muscles called “ciliary” eye muscles that pull the eyes in all directions. When eye muscles get weak, vision becomes unfocused and our eyesight weakens. The eye muscles have lost their power to focus the eyeball itself on a close or distant point. Myopia (nearsightedness) and presbyopia (farsightedness) are the result of weak eye muscles. Practice the eye exercise techniques below two or three times a week. Take a one-, two-, or three-day rest between each eye session, depending on your energy level. The day after your first eye routine your eye muscles may be sore. Do not worry; this soreness will gradually leave. Soreness means that you have “worked-out” weak eye muscles that have lain dormant for many years. They are resilient and, like your biceps arm muscle, will respond with renewed vigor. The rest period between each eye exercise session is as important as the eye exercises. During periods of rest the eyes and body heal and rebuild, imparting strength and health. Performing eye exercises too often can easily cause eyestrain, which is a basic reason why most eye routines fail. The Egyptian Black Dot Technique is one of the most important exercises for all eye conditions. First prepare your black dot on a 2-inch x 3-inch white card. Draw a black dot about the size of a dime on the card with black ink. Note: If you have trouble seeing things up close (farsightedness) do not perform this first part of the Egyptian Black Dot technique. Perform the second part only. 1. Hold the card in front of your eyes at arm’s length. 2. Next, move the card to the tip of your nose and gaze at the black dot for 30 seconds. Do not move your head; move the card only. You must see only one dot. If you see two dots, move the card away from your nose until you see one dot. 3. After 30 seconds move the card straight out in front of your eyes, then rest and close your eyes for a few seconds. 4. Next, raise the card up between your eyebrows and gaze at the dot for 30 seconds. Move the card as close as you can while seeing only one dot. Rest for a few seconds. Be sure that you only see one dot; this means that both eyes are working together. Be persistent and consistent and you will see results. Remember to breathe gently, deeply, and naturally. 1. While keeping the head still and straight, move the black dot to your right shoulder and gaze at it for 30 seconds. 2. Then, move the dot to your left shoulder and gaze at it for 30 seconds. Close your eyes and rest. Farsighted people can perform this shoulder-to-shoulder black dot exercise with great benefit. The Egyptian Black Dot Techniques make the eye muscles focus in positions in which they do not normally focus. This helps to reshape and balance the eyeball itself. Cut out three 1/8-inch to 1/4-inch thick letters from a newspaper or magazine and glue them on a 2-inch x 3-inch white card. Perform each movement with one eye at a time, then use both eyes together. The eye that is covered with your palm is to be kept open during the exercise. This enables both eyes to work together during the exercise. Start out with three repetitions in each direction. Every two to three weeks add one repetition until you reach six repetitions. 1. First Movement: Hold the card twelve inches in front of your eyes. Concentrate on one of the letters, always focusing to see it clearly. Move the card above the eyes and below the chin three times. Do this one eye at a time and then both eyes together. Keep your head still--move your eyes only. 2. Second Movement: Hold the card twelve inches in front of your eyes. Move it slowly from your right eye to your left eye--always keeping sight of the letters. Perform with one eye, then both eyes together, three times each. 3. Third Movement: Hold the letters in front of your face, and move the card in right and left diagonally. Perform three times each way. Again, work with one eye at a time, then both together. 4. Fourth Movement: Move the card in large circles, at arm’s length. Perform three times each way, one eye at a time, then both together. 5. Fifth Movement: Hold the card about twelve inches in front of your head and move the card smoothly in a ten-inch-diameter circle. Perform ten times clockwise and ten times counterclockwise. Perform with one eye at a time, and both eyes together. Preschool children naturally look in all directions with their eyes. Schoolchildren are taught to look directly ahead and down at their books. After many years of this poor eye habit, they stop looking in all directions, and the eyeball loses its natural shape. Consequently, vision problems result. The Egyptian Letter-Gazing Technique enables the eyes to focus in all directions and allows both eyes to see together. It also helps to reshape the eye back to its normal position so that light can focus on the retina properly for perfect eyesight. This technique coordinates the mind and eyes to work in perfect harmony. Practice will bring improvement. Stick with it! Persistence is the key to success in vision improvement. Robert T. Lewanski is a certified Ayurvedic counselor in nutrition and health. He has studied Sun Do meditation, Chinese Five Element nutritional body typing, and Taoist Chi Kung Yoga from Korean master Hyunoong Suinum. He lives in Michigan. "For me, I was most attracted to the exercises and sections that could help reduce eyestrain and relax my tired eyes. 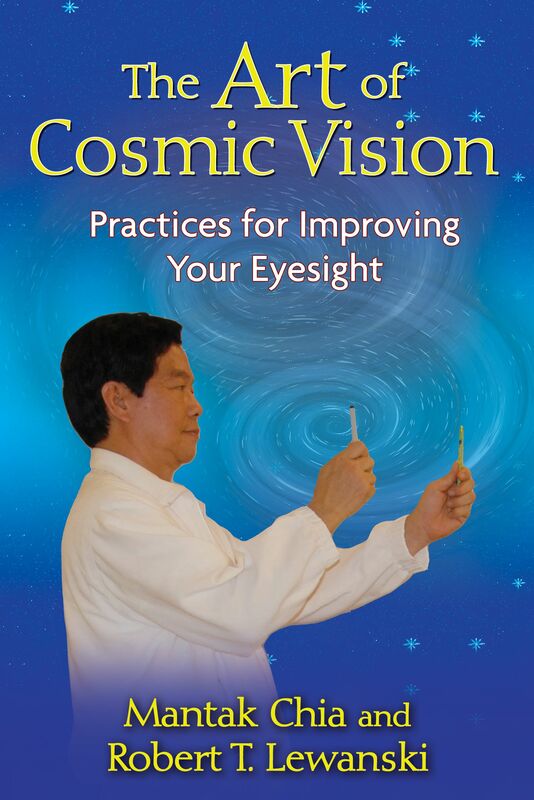 The Art of Cosmic Vision provides an ample variety of choices." ". . . Chia and Lewanski have a system that may work for our Western society. Combined with their methods and the desire to correct our vision, The Art of Cosmic Vision is a tool that does make the change."